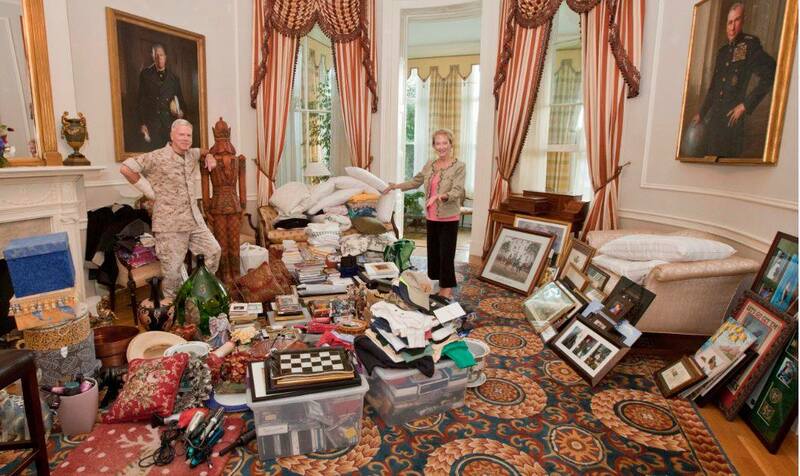 Bonnie Amos and her husband, Commandant of the Marine Corps Gen. Jim Amos, are busy packing up for what she says is their 30th move in not quite 44 years. It will be the last move of her husband’s military career, however, as the Marine Corps’ “first couple” readies for retirement and begins vacating the Home of the Commandants at 8th & I, in Washington, D.C. The passage of command, when Gen. Joseph Dunford will officially take charge as the 36th commandant of the Marine Corps, is set to take place Oct. 17. The Amoses won’t be taking everything though. Tradition stipulates that each departing commandant leaves something in the house for his successor. For now, Bonnie isn’t saying what it will be. “Can’t tell you yet…it is a surprise and will hopefully be in place the day of the Passage of Command. you’ll just have to come visit,” she replied to one follower of her official Facebook page. 17 Oct can’t get here too soon. Enough with the current Commandant, the “First Lady” and “First Family” BS. Gen Dunford will be a welcome change from the Cult of Personality emanating from the Amos Commandancy. It simply can’t end soon enough. Not what I would consider an “outstanding” tour of duty. Too much controversy, too much “alleged” bullying of subordinates both officers as well as general offices. General Dunford will be a welcomed relief. I like how Marine Corps Times is moderating this post. A lot of my budddies comments have been shot down cause they don’t want Amos to get his feelings hurt or bad mouth him and his wife on his way out.